Oops he did it again. Obama has submitted a budget that plays with our hearts, but got lost in the game of Chicago patronage politics. For anyone who thinks this is an act of governing, well he’s not that innocent. If we were not dangling on the edge of a global sovereign debt bubble this would be somewhat acceptable in an election year. The problem is he did the same thing last year. Obama has essentially been in campaign mode for nearly two years now, delaying every important decision until after his own reelection. Like so many companies – including many that had faced trouble on Wall Street – the United States had recently become intently focused on the challenge of rolling over its debt. The level of U.S. debt held by foreign countries was unprecedented. The leverage that this might give them, and especially China, over the United States had been a much discussed fear since the Great Panic of ’08. Over the past few months, though another question had arisen: What if the United States held a Treasury auction and no one came? It seemed as though the so-called indirect buyers of T-bills, mostly foreign countries, were not showing up in their usual numbers and the U.S. government [via the Federal Reserve] was having to pick up the slack. With today’s shifting numbers, Obama was growing concerned. He’d been briefed on the T-bill issue by Orszag, and how the disfavor of foreign T-bill buyers could be disastrous. He remembered, as many did, the notable exchange between Alan Greenspan and Bill Clinton in 1993, revealed in Bob Woodward’s book The Agenda, when Clinton asked if his presidency would be determined by how he was seen by the bond market. Greenspan said, in fact, it would. Clinton eventually balanced the federal budget and became a darling of the bond markets, which graced the U.S. economy with about 2 percent in credit costs, which it had been holding back under the assumption that the federal government would never get its fiscal act together. When it did, and interests rates fell, borrowing and economic growth surged. Now the United States, from the federal government to corporate offices to kitchen tables, was suffering from an inverse equation. With household debt at nearly 130 percent of GDP – up from 68 percent in 1992 – sluggish growth, and enormous federal deficits up another $90 billion, what was needed was a massive deleveraging. With the bad fiscal news he was about to deliver, Obama wondered how the next Treasury auction would go. Maybe no one would show. Orszag looked at him quizzically, making sure he’d heard right: the president wanted a memo that wouldn’t get read first by Summers or Emanuel, or circulated by the White House’s staff secretary. Orszag’s mind raced. He knew that the new president had a great deal to learn, and might be resistant to the training program that both Emanuel and Summers were keeping him bound to. So Orszag wrote a memo that described what it would be like if we could not sell our bonds or had to do so at even historically normal interest rates: massive and acute austerity. A shock therapy reserved for third world countries, we would have to immediately slash spending across the board and hike taxes up in a way that would guarantee a dip back into recession. Ironically, two years later when Obama described the consequences of not raising the debt ceiling, he basically quoted from Orszag’s memo. There will ultimately come a point where we can raise our own debt ceiling all we want but still have maxed out the risk tolerance of bond buyers. Like all financial crisis, the day before it happens, nearly all the experts will believe that day is far away, but the day after it happens, all the experts will explain to anyone willing to listen how obvious and predictable the inevitable was. Orszag made clear to the President that there will be no way to predict the bond market’s turn. Like any other organization, the more debt the US government takes on the more risk it bears. The president received the report on May 15. It took just a few days for Summers to hear about it. He found out through Emanuel. Orszag looked up from his desk. Summers had stormed over from the White House to Orszag’s office, and his face was red with rage. It looked like he was about to burst a blood vessel. He told Orszag he’d found out about the paper. He told him that he, Peter, knew the rules, no matter what the president had said. Everything was supposed to go through NEC. Then its chairman, Lawrence A. Summers, blew a gasket. “What you’ve done is IMMORAL!” he shouted and stormed out. Enough was enough, Rahm Emanuel decided. Something needed to be done. He summoned the two competing super-egos, Summers and Orszag, and told them to make peace. After all, they were each responsible for huge swaths of the federal government. And they were fighting at every turn. After a bit of delicate negotiations, it was decided that they’d meet once a week for dinner and see how it worked. So, that night, Orsag settled into a white-clothed table at the Bombay Club, a posh Indian restaurant across Lafayette Park, a favorite of lobbyists and White House officials. Summers walked in, slightly late, but not impolitely so, and met Orszag at the table. And then it was the two of them. Orszag hoped that this time the White House would be less fraught with strife than the last go round during the 1990s. Summers said it kind of came with the territory. This talk of their shared history seemed to thaw things out. They both grabbed from the plate of flatbreads that everyone gets served – the restaurant is known for it – and tore corners at the discus-size breads. Over the past few months, Summers had said this, in a state whisper, to Orszag and others as they left the morning economic briefings in the Oval Office. The topics varied: taxes, deficits, the economy, economics in general. No “adult in charge” of the world’s mightiest nation at its time of peril? It bespeaks a crisis – of a president overmatched, unable to fulfill the duties of his office, and a nightmare no one wants to acknowledge in daylight. He sat in meeting after meeting where the president would cover the same issue, or controversy, or policy dilemma, and “relitigate” it, in the president’s parlance, over and over. Decisions were left unmade; policies drifted without direction. It wasn’t a matter of intellectual framing. The president seemed to grasp the nature of key policy dilemmas, like a journalist, or narrator, or skilled observer. The problem was in guiding the analysis toward what a president is paid, and elected, to do: make tough decisions. Hillary Clinton tried to make Obama’s frequent “present” votes on tough issues in the Illinois legislature a wedge issue in their primary. At the time people wondered what those votes revealed about how Obama would govern; now we know. 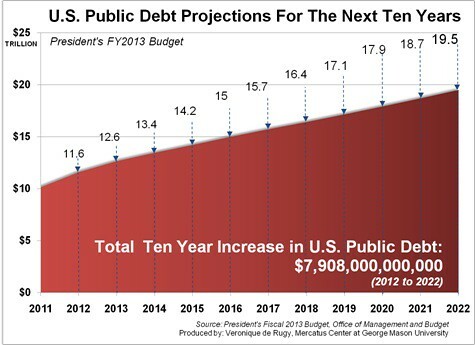 Obama’s budget last year and this year are a way of voting “present” on the toughest issue facing us today. Last year Obama could have offered a partisan Democratic alternative to that very partisan Ryan budget plan. Instead Obama offered a budget that neither cut spending nor raised taxes. It was a budget that intentionally avoided making any tough decision, pretending that there wasn’t even a problem to deal with. His budget did not fail because of Republican obstructionism as Democratic operatives would have us believe. Republicans let it come up for a vote and Obama’s budget failed 97-0. IT WAS THAT IRRESPOSIBLE! Not even a single Democratic senator would vote for it. Obama’s chief of staff Jack Lew hit all the Sunday morning talk shows last weekend and was called out by each interviewer for the Obama administration again offering a budget that ignores our fiscal problems, and Senate Democrats offering no alternative of their own. What was his response? I was shocked that each interviewer let that response go. To those who would blame this on media bias, I would say it has more to due with the shallow expertise of TV journalists compared to print media. Not a single major newspaper in America let them get away with such an intentional misrepresentation of our budgeting process. Indeed the Washington Post, no cheerleader for holding government spending to a tight budget, gave Obama’s message machine FOUR Pinocchios. Budgets are passed by simple majority; they cannot be filibustered. Democrats were willing to pass Obamacare through reconciliation, but they won’t lift a finger to pass a budget. Before becoming Chief of Staff, Lew was the White House budget director. This was not an innocent mistake. This was intentional deception of the worst order, and it seems to be working. The White House budget for FY2013 begins with a broken promise, adds some phony policy assumptions, throws in a few rosy forecasts and omits all kinds of painful decisions. Even then, the proposal would add $1 trillion more to the national debt than Obama contemplated a few months ago — and it is a non-starter on Capitol Hill, where even Senate Democrats have no plans to take it up. It is, in other words, exactly what it was supposed to be: a campaign document. If Obama has lost Dana Milbank has he lost middle America? I’m not sure. Like a Chicago alderman in Mayor Richard Daley’s Chicago, Obama’s skill set amounts to patronage spending when the money is there and blaming others when the money is not. Actually, if you have read his two memoirs, the formative political figure in Obama’s life was Chicago Mayor Harold Washington. Like General Motors and Lehman Brothers, this is an organizational culture that goes along to get along, kicking the tough decisions down the road. When the troubles catch up with you they are always someone else’s fault. Over-leveraged organizations like these never make the hard choices on their own terms to proactively prevent crisis. They chug along until credit markets turn on them in a way that threatens their organizations’ very existence. I am not sure we have ever had a president like this before. Reagan, Clinton, and both Bushes worked hard to pass budgets with an opposing congress controlled by the other party. Those were divided times too, but the man in the oval office did more than just vote “present.” Obama’s predecessors did not face the existential threat that our current fiscal position challenges us with, and yet even with their lower stakes, none of Obama’s predecessors thought they could cease budgeting for the last two years of their first term. Clinton would not have made these mistakes indeed, but Obama is not that innocent. Eric Shierman is the author of A Brief History of Political Cultural Change. He also writes for the Oregonian’s My Oregon blog and lives in Portland.